© Honey bees have evolved to live in hollow trees so their oldest enemy is fire. They will fly away abandoning the nest when the fire gets too hot for them so as soon as they smell smoke they prepare for the worst by first filling their honey crops ready for flight. The flying bees in a bee hive will react to the smell of smoke in the same way as they do in the wild. They will prepare to abscond by first filling their honey crops, diverting their behaviour away from defending the nest, they just can’t do both. This takes their attention away from the intruding beekeeper. Of course, there is no fire to make the bee hive hot so the bees do not fly away. 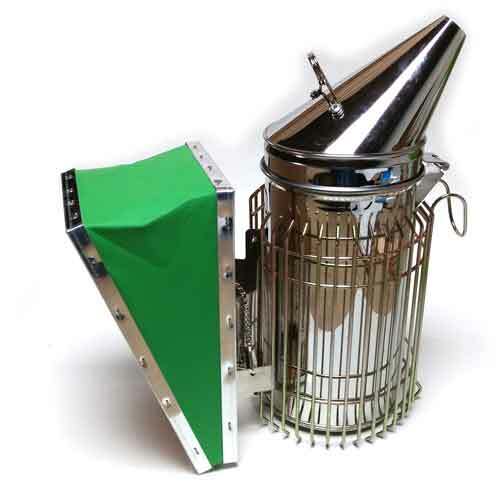 The bee hive smoker is an essential piece of equipment. They can vary in size and design but we have used them all and could not recommend one design over another, all bellows operated bee smokers do the same job. The correct use of the smoker is essential when handling a colony. In optimum conditions some colonies can be opened and examined by an experienced beekeeper without using one but unless the reaction of the colony to disturbance is certain it is not recommended. Only use paper or cardboard to start the fire in the smoker, never use it as fuel for smoking the bee hive because it burns too hot and contains chemical additives. Only use natural fuel made from dried vegetable matter such as dry grass clippings, hay, straw, dried leaves or pine needles. These make make perfect fuel producing the dense cool smoke needed and are easily acquired. Natural vegetable fibres such as untreated hessian, jute or cotton are also good fuels. Start the fire by lighting a small amount of crumpled newspaper in the bottom of the fire box. Keep working the bellows all the while to make sure it is well lit. When this is producing flames, add the smoker fuel a little at a time whilst still working the bellows. Don't cram the smoker full of fuel too soon or the fire will be choked and will go out. When the fuel is alight further smoker fuel can be added as required until the smoker is producing large quantities of cool thick smoke. It is important that the smoke is cool and thick before using the smoke in the hive. Smoke the entrance of the hive first and allow 2 minutes for the bees to respond before smoking again before opening. It is important to continue frequent use of the smoker whilst the hive is open throughout the inspection to keep the bees down in the bee hive and under control. The use of manipulation or cover cloths on exposed boxes is also recommended. Beware not to use hot smoke or allow the smoker to start spitting flames or sparks which can have the opposite effect, hurting and provoking the bees. Keeping the smoker topped with fuel will help prevent this. Adding fresh green grass to the smoker will help to smother any flames or sparks and cool the smoke if necessary. The water sprayer is a useful tool to have for the apiary. Its use can discourage bees from flying, encouraging them to cluster, very useful when collecting swarms. However, its use during inspections is ill-advised; it is not a substitute for a smoker.